I need to start this post with a confession. I’ve never been a pancake person. There I said it. I’ve never ordered pancakes at a restaurant, I always find them rather boring, or dry, or dense and hard to swallow, or too soft. I’m a texture person. I think that’s what it is. People would pile mounds of pancakes onto their folks and shove them in my mouth with excited looks hoping I’d finally be like, yes I get it. But it never happened. Until I met a humble packet mix: Naked Seeds. As a healthy person who is fructose intolerant, it’s rare to find packaged food without sugar or fructose filled natural sweeteners. 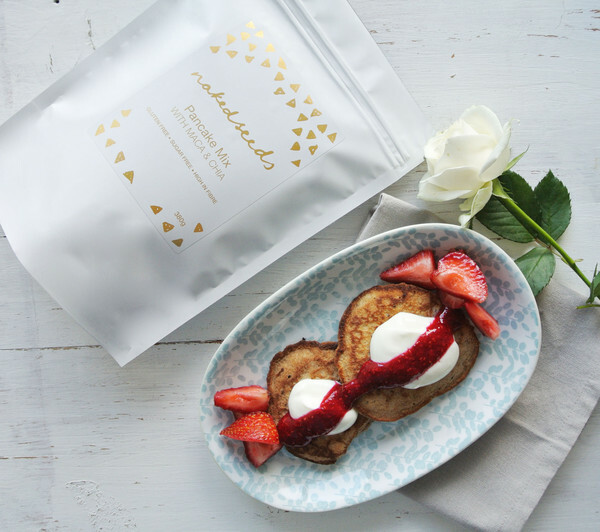 Naked Seeds is a stunning mix of 100% natural, gluten free, fructose, and sugar free ingredients from buckwheat flour, to maca powder, to chia seeds and cinnamon. And it converted even me, the pancake hater. So I had to chat to Sofie, the gorgeous woman behind the mix and find out more. Let’s here what she had to say. Amy: As an Osteopath, a wellness blogger over at Superfood By Sofie, and clearly a health enthusiast, can you tell me what started your health journey originally? Sofie: I think it’s something that is engrained in me. I don’t remember a specific turning point that made me feel that ‘today was the day to start to eat healthy’. It was more of a gradual lifestyle I was building for myself. And I loved the way it made me feel, as well as how it felt to inspire others to eat and live healthy. Superfood By Sofie the blog began when I moved out of home as a way for me to record the healthy recipes that had turned out successfully (there have been plenty of mishaps!). I thought it would be a fun way to create my own recipe book, so that others could benefit from it too. As an osteopath I have learnt to find ‘health’ rather than just cure disease, and my 5 year university degree has taught me so much about balance, life, and holistic health. You experienced a parasite on a trip to India, can you tell us what that was like for those who’ve never experienced something like that on their digestion before? I spent 3 months back packing in India with one of my best friends. We both got a little stomach bug – which was expected when travelling for such a long period of time in hostels, which were not the most hygienic of places. It wasn’t until about a month after I got home that it hit me. I had no energy whatsoever, I would eat half a banana for breakfast and my stomach would go insane at me – and I would collapse on the couch after a half day at uni. This was so abnormal for me as usually I am full of energy and buzzing all day long. After a couple of rounds of medical treatment, I got back to being my normal self about 8 months later. I would hate to think about the scarring on my gut lining after the doses of medication I had. I love your approach to superfoods, that they’re just beautiful foods available almost everywhere. What would be your favourite superfoods right now? I love the idea that eating healthy doesn’t have to be complicated. We don’t have to eat foods that we can’t pronounce or don’t know where to buy it. Mother nature has given us an abundance of foods that have such healing mechanisms, and we must be appreciative of that. I guess my personal definition of a ‘superfood’ is really any food that is good for you. 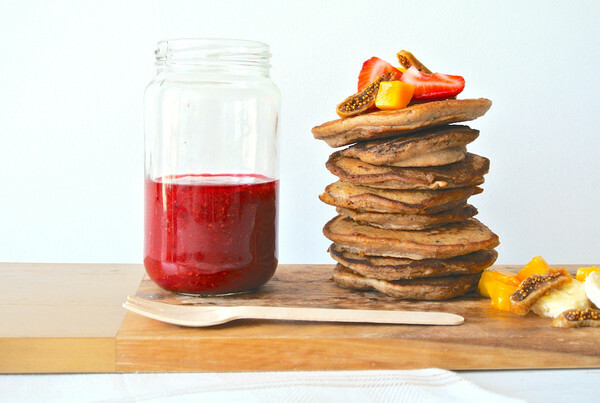 My favourite superfoods right now are chia seeds – so versatile and all the good stuff is in there! So, let’s talk about Naked Seeds! 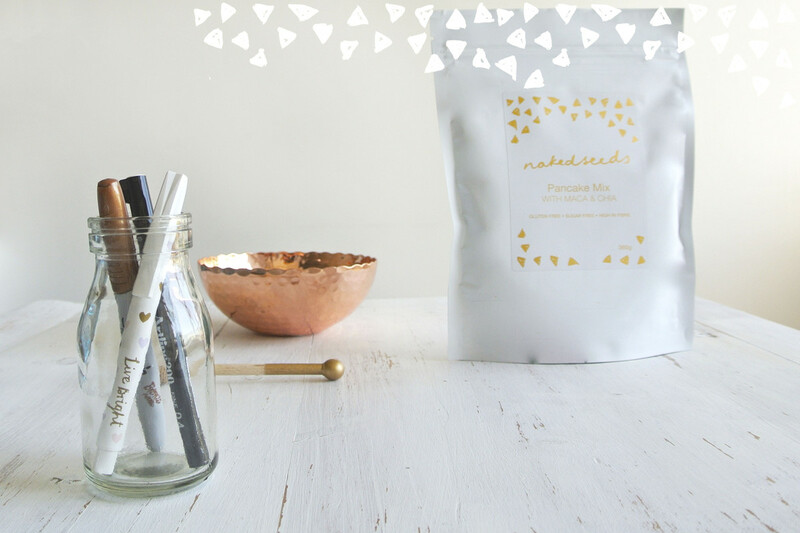 The beautiful pancake mix you’ve created. How did that start? What drew you to making a pre-made product? And why pancakes? Naked Seeds started by me imagining what life would be like if I did exactly what made me passionate. Holistic health is what I’ve learned to be aware of and I love inspiring my patients to lead a healthier lifestyle in addition to hands on treatment in the clinic. After endless amount of thought going into creating a product, I decided I wanted something that was easy for the consumer to make, made of 100% wholefood ingredients, and something that tasted delicious. I came up with the pancake idea and it just felt so right – so I rolled (or should I say flipped) with it! Do you have a team behind you working on recipes, or it is pretty much a one-man show? At the moment it is pretty much a one man show, 24/7 work – but I love it! Will definitely need some helpers soon. What time of day is your favourite to eat pancakes? It doesn’t have to be the standard breakfast time. My favourite time to eat pancakes is mid morning. After I have had a small bowl of something in the morning to get my metabolism going, been for a loooooong walk down at the local beach, and come home to relax and fill my belly with something nutritious. I do also love them for dinner! What is your tip for making the best pancakes? Naked Seeds mixture is so easy to get right, however everyone has their own opinion as to how thick their pancakes should be. So a little tip is to put water into the mix last so you can adjust the thickness of the batter to your taste (personally – I think the thicker the better!). Then, the best pancakes are made on a high heat, pan fried in a tablespoon of coconut oil. 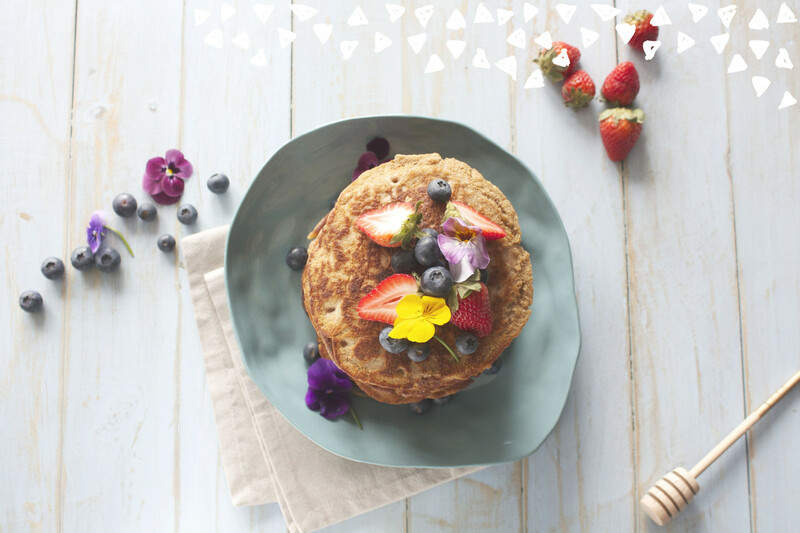 You can see how to make the perfect pancakes on our website. 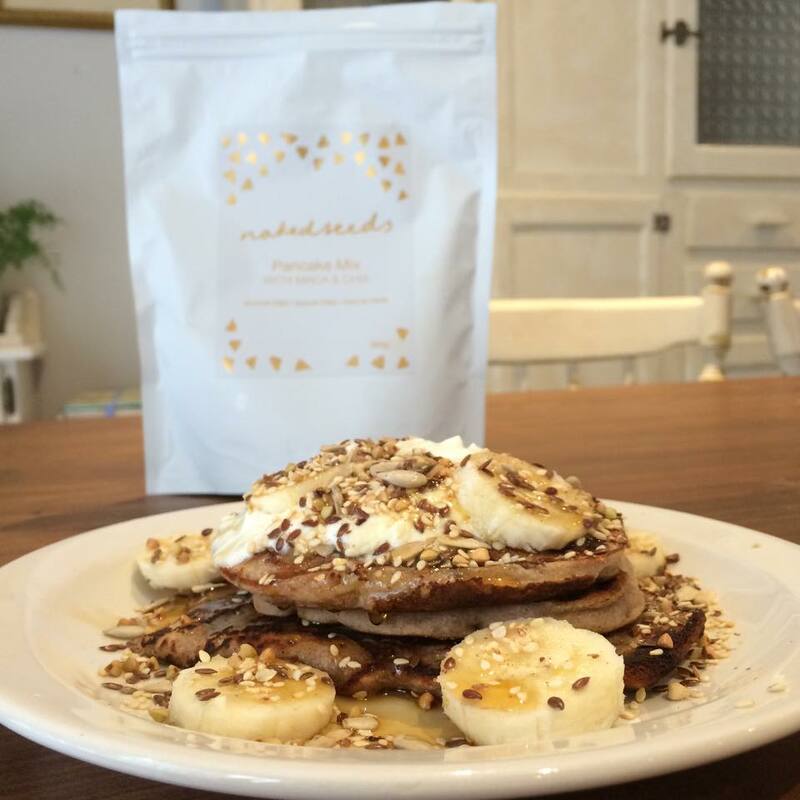 What are your favourite toppings to put onto your Naked Seeds mix? Definitely! Stay tuned – exciting things are coming VERY soon!! You can buy Naked Seeds from Sofie’s website www.nakedseeds.com.au and make sure to check out her blog for more inspiration www.superfoodbysofie.com. The images above are courtesy of Naked seeds, but for those playing at home, here’s my stack.